Most bikes wouldn’t speed down as they take a turn around the necklace shaped road that takes them towards Panjim from Madgaon. Most four wheelers wouldn’t have enough time to stop by and gaze once on the left side – on the left side at an old bridge and a village that has sunk into oblivion. But I had to somehow. I just had to look at that place which seemed strange and yet beautiful in some odd way. That place, which sat beyond the lonely bridge taking a long jump over the sea & landing all the way across to that abandoned place. ‘Saint Jancito Island’ is what the dusty aged board on the sides told me its name was. I took a deep breath as I glanced towards this small town, which I was sure did not have enough guests for a while. After parking my bike, I started walking down the bridge…walking because I did not want the speed to murder any of the passing details of the place. Sherlock Homes in me was already trying to comprehend as much as I could about this god forsaken island. The bridge was lined up with as many as 25-30 old-fashioned street lamps holding lantern shaped bulbs on both sides of it, that ran all the way to the entrance of the village. Maybe once upon a time, it needed to save itself from the darkness and dark forces which brought down its walls and conquered it. Its dealings with the dark world were evident, as I was welcomed by four crosses right at the entrance of the village. They stood there straight, artificially creating a safe (?) passage to pass through. So, I deliberately walked from the other road to see if air was any thick otherwise. To be honest, it did hold a gloomy feeling under its every current that moved with resistance. It was as if St. Jancito Island had secluded itself from rest of the world. This village had refused to participate in the transformation of nearby towns into a modern globe. It was as if pages of the calendar got stuck and time got handicapped to pace any further at this place. Leaves had not moved much. 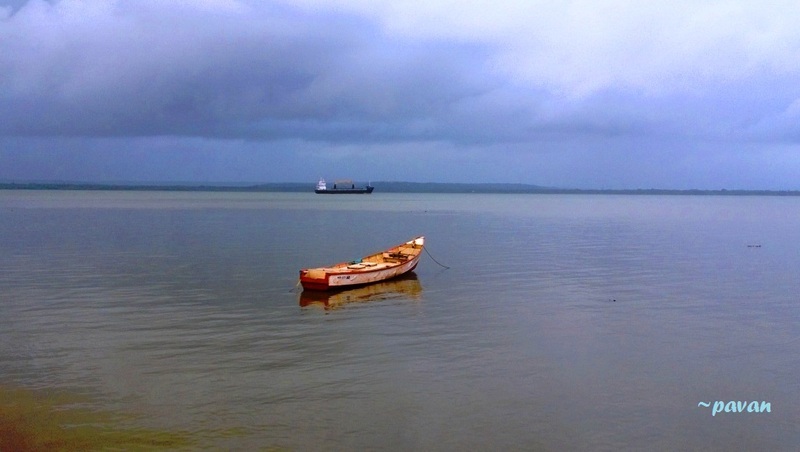 A lonely boat waited at few feet of distance from the shore. Several large ships could be seen far away in the ocean, but none of those seemed remotely brave enough to march towards St. Jancito. I wondered what had brought this place such an ill fortune and aversion from others. I looked around and could only find one lonely ship swaying slowly in a pool of ocean water kissing the shore. Something told me that it once unsuccessfully tried to rescue somebody from this forlorn land. “Maybe I should leave” thought struck my head and before the gloominess could force me to desert St. Jancito, I suddenly heard some signs of life. A little girl wearing a ‘once used to be knee length frock’ was running around with a dark brown kitten, chasing it and then it chasing her back. She slowed down as she spotted me standing at the edge of the road and the kitten started rubbing itself to her ankles and feet, not bothered by my presence. “Are you looking for my father?” she asked scrutinizing my clothes. “Are you searching for a place to stay for the night?” she improvised her question looking at my puzzled face. “Well…I do not know. Does your father own a hotel or something?” I replied knowing I had gotten carried away and actually thought of staying back in this place. “No hotel. We have a big house. He can give you a bed to sleep on and water. And food. But he will take money from you for food” little girl gave me as much information as she could. “Yes. But we must move fast. Or else you will miss the evening tea that George Uncle makes” she said while moving towards interiors of St. Jancito Island. I followed her around and the kitten walked on the other side; matching our speed, jumping over little rocks that crossed its path. Three of us moved through an empty road bordered by dark green grass on either side of it, before reaching an upward slope which gave me a glance at a hidden town. “There it is!’’ girl pointed out to a house sitting in the distance with a slanted rooftop. I realised that she had probably never moved out of the town looking at the size of it. It was not ‘big’ as we urbanites would think. But then I was still happy to have found people staying in there. “So where…” before I could complete my sentence the little girl in frock ran ahead of me all the way to the fat mango tree at the corner, only to be followed by the kitten-not hiding signs of tiredness anymore. “Walk fast and go to the other end of the house. You can meet him over there.” She said and disappeared behind the tree like a friendly ghost leading me to the house. I did not have enough time to wonder. I started walking. I had already imagined how her father & George uncle must look like in my head. Those characters convinced me to follow her & her kitten all the way up here. So, I walked few feet ahead of the tree and reached the front face of that house. And I almost got a shock of my life to be welcomed by a neatly made garden filled with almost a hundred people. People who were sipping wine, relishing delicacies out of perfectly cleaned plates and wearing big smiles. Yes smiling…All of them. And with my feet crossing the border of the house, there rushed an eerie silence all of a sudden. They all stopped conversing and turned their heads towards me. “Me? ?” I made worst of surprised faces I ever had. “Yes. Come over, have something to drink”, a thin girl held me by my left arm and led me to the round wooden table set with two glasses filled with champagne. She made me sit there, while keeping intact the smile on her face and left me amused staring at the glasses in front and annoyingly happy people around. Happy they were, so much in contrast with how the island looked like when I first entered it. I was not going to pinch myself, because I knew for sure that dreams are not this vivid. I continued studying those faces. They genuinely seemed to enjoy each other’s company, as if they had been longing for it from a very long time. “What the hell is this place?” I thought yet another time and there came a shadow of something in between the faint sunlight and me. Rather someone. Someone I had not seen for a while, for a long time in fact. “You?” it was my worst surprised-face number two. “Why? Were you expecting someone else in your head?” she said as she moved wavy hair off her face and gently occupying the seat opposite of me, adjusting her deep yellow dress. In reply she simply smiled and raised the champagne glass and waited for me to do the same. “Will you stop with these stupid questions now and rather enjoy this time with me? We really haven’t. Both of us. For such a long time”. “I couldn’t agree more. I miss…I really miss us sometimes” I said and made a toast to the time that we had spent together. “You look, you look stunning. Almost the same, just a little older. Exactly as I thought you would, when you grow up.” I said everything at a length. “Stop playing with words again, you. Your words, I cannot handle them. Too sweet and too sharp at the same time” she said keeping a forefinger on my lips. We drank some more champagne. Then some glasses of wine. It was all perfect. Like a golden time. Like being together at a cafe on the corner of streets of Paris that we both always talked about. Then some people gathered around us and took us to the open space nearby. They were playing music. Moonlight sonata was changed to party music and we all started to dance together. I danced with her and tried to match her steps as she tried not to laugh at me. Then I finally gave up and watched her dance. With our talks and our dance and our long talks again we sent the moon around behind the mountain range. Round and round. We had lost count of time. I did for sure. I did not want to stop. And we went on. I do not know for how long. I could not measure it in time. “I do not know. Where are we? I have not felt an ounce of sleep in past how many days?” I asked her as she rested her head on my shoulders. “You really do not get it. Do you?” she mocked at me. “I do not. Yes. That is why I am asking you again. What place is this?” I was getting a bit irritated by her callous attitude about most of my questions. “C’mon baby. You know, you have always been clinging onto me. So you are living it now”. “You think? Look around. What do you see? People who are willing to be dipped in happy streams of their past, not wanting to move ahead. And congratulations, now you are one of them”. I hated to accept the fact that she might just be right. “And you? So are you, right?” I asked her like a seven year old child. Once again she smiled in reply and kissed me on my cheeck. I pushed her away in fear and anger combined. I checked my watch, it wasn’t of any help. I was breathing hard, feeling helpless. I thought of my family, my friends and my job. I thought of the things I had to do for my future-self. This certainly was not the place for it. “I do not want this. I do not.” I dragged myself away from her and from the crowd. I started walking fast back in the direction of fat old mango tree, hoping that at least it was real. I turned around once to spot her still sitting there, looking at me, smiling. It was as if I had invited her to haunt my mind. My feet increased their pace before I knew it and I started running. I saw the little girl who guided me to my nostalgia island standing there where I first saw her. She waved at me and her kitten stopped playing to look at me with a tilted head. I kept running. I finally started making sense of gloomy face of St. Jancito Island. I understood what the lonely boat suggested. Nostalgia was the house for one to stay here. For those like me who had been clinging onto their past, thinking doing so will make it stay with us just a little longer. For us who sucked at goodbyes. Nostalgia, an erroneous imagination of us, that a particular period of our past in fact was a golden time. A flawed belief that golden time is all about happiness and that is as far as content one can be. Running out of my breath I managed to cross the bridge. I breathed in fresh air of present life. Realisation of true worth of living the present moment filled my heart with a pinch of sadness that I had given up so many of such moments. St. Jancito Island was certainly very tempting to be at. A temptation too good for one to fall for.